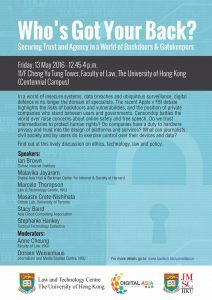 Citizen Lab Research Manager Masashi Crete-Nishihata will speak on a panel discussion at the University of Hong Kong Faculty of Law titled “Who’s Got Your Back? 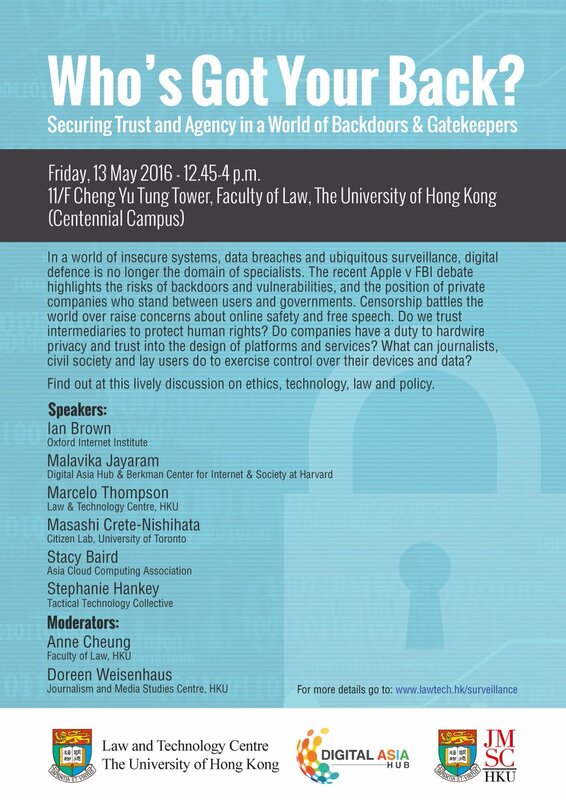 Securing Trust in a World of Backdoors and Gatekeepers.” The event will be held at 11/F Cheng Yu Tung Tower on May 13 from 12:45 – 4:00pm. Other speakers include Ian Brown, Senior Research Fellow at the Oxford Internet Institute, Malavika Jayaram, Executive Director at the Digital Asia Hub, Marcelo Thompson, Professor at the HKU Law and Technology Centre, Stacy Baird, Chairman of the Data Sovereignty Working Group for the Asia Cloud Computing Association, and Stephanie Hankey, Executive Director of the Tactical Technology Collective. In a world of insecure systems, data breaches and ubiquitous surveillance, digital defence is no longer the domain of specialists. The recent Apple v FBI debate highlights the risks of backdoors and vulnerabilities, and the position of private companies who stand between users and governments. Censorship battles the world over raise concerns about online safety and free speech. Do we trust intermediaries to protect human rights? Do companies have a duty to hardwire privacy and trust into the design of platforms and services? What can journalists, civil society and lay users do to exercise control over their devices and data? See the event website more information. Unless otherwise noted this site and its contents are licensed under a Creative Commons Attribution 2.5 Canada license.